Objective: Do you want to be a math wizard? Then prepare to merge tiles of identical numbers until you get 2048. 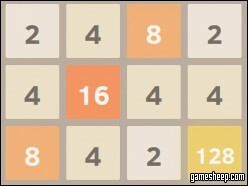 Make sure you always have two tiles of the same number so that you can win this super addictive game. We are glad that you have chosen to play 2048 on GameSheep.com, the most dynamic website available. If you like this game 2048 don't forget to rate it and this way you will help with selecting only the best games for the home page.